Brilliant, Nate! You’ve written a powerful paean to this lost warbler. I’ve always felt that if there is an american bird extinction we may hope hasn’t happened it is that of this species rather than the IBWO. I wouldn’t be too surprised (but I would be delighted) to hear of a small population popping up somewhere. Any thoughts as to whether or not Bachman’s Warbler was a “true” species? I”ve heard some compelling theories/arguments that this bird was a hybrid (hence the wide range, but limited numbers) or perhpas a sub-species of another southern warbler, the Hooded which it closely resembles. A third theory is that Bachman’s is like Golden-Winged Warbler, a bird that got genetically crushed by another very similar species (again looking at Hooded). @Tai Haku- That would be nice, but I, for one, am not optimistic. 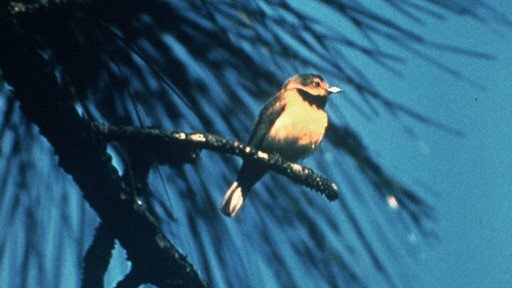 There’s talk of potentially good habitat in Congeree Swamp in SC, but that’s a pretty heavily birded area and for one to hold out there would be unlikely. @Will- I hadn’t heard that, but it’s intriguing. I wouldn’t peg Hooded as a potential sub-species, they look superficially similar but their songs and habits are really different, but the Golden-winged hypothesis is really interesting as GW and BW Warbler are the Bachman’s closest relatives. In light of the genetic similarities between Gold-wing and Blue-wing Warblers, could Bachman’s be the southernmost cline of a super-species? Beautiful Nate. I love how Bachman’s Warbler featured front and centre in the book, The Ghost with Trembling Wings by Scott Weidensaul. A wonderful book about the search for lost species, such as Bachman’s Warbler, IBWO, and the Thylacine. But I digress. Wonderful job on the post. Lovely piece. I hate how many of the extinct birds you mention are so overlooked. I might be naive, but it seems possible the bird still exists. Some dedicated birders I know have conducted several searches for the bird (and found some other great ones while doing so!). This is a beautifully written post, Nate. A highlight of warbler-week both in content choice and execution.